Its been a while, hasn’t it? In keeping with the wishes you guys expressed in this post, both in the comments and on Facebook, I suppose its time to give you an update. Well since its September, Dave has to be thinking about going back into work properly. I’ve been very lucky so far in that I’ve had him all to myself for most of the summer and lots of help in the form of family and friends. Now however I’m testing the waters to see how well I an handle a day on my own. Frankly put, its still too bloody hard, but I know now, that if I really am on my onsies for a day, I can handle it. It doesn’t happen all that often though. The boys are four and a half months now and growing so big! I can hardly reconcile old pictures to what they look like now. All smiling and chubby and full of expression. Michael is so serious and there are so many pictures of him gazing intently into the distance while Leon is the goofy one. He’ll smile or gaze at you (or something) totally cross eyed. I love the way their personalities have leapt forward, and so firmly as well. I can even tell the difference from earlier weeks when they were testing themselves and what they liked. Now they are very clear in when they’re happy or unhappy or even just bored. They have little signals for when they’re tired and such a bizarre sense of humour that I really can’t deny that they’re my kids. Leon particularly really enjoys laughing at my face. Is that just a baby thing, or is my face really that strange to look at? To date, the lads have attended three BBQs, one Pride parade, three sleepovers and the local Caribbean carnival. They did this in various states of awareness, but they did do it. I’m ever so proud of them. Leon in white, Michael in red. Told you… thoughtful stare into the distance! Right now, I’ve managed to catch them taking a nap, but I doubt it will last long. They have decided, as one, that night time is for sleeping in two hour bursts with a two hour wakeful period at about 3am in which they grab their teddy bears by the foot and proceed to gnaw on them, very loudly, while mummy covers her head with a pillow. Something else that seems to make them both laugh! Coming up in their lives is Halloween, Christmas, their naming day celebrations and possibly another residential trip as they come with me to Conception. By then they may be either teething, crawling/walking or both. Lord help us! Still, I wouldn’t trade up for anything. I love how I feel when I’m with them and when they look at me. Each morning, when I’ve finally accepted that I’m not getting any more sleep, the little smiles I get on putting my head over the cot are totally worth it. They’re so beautiful! 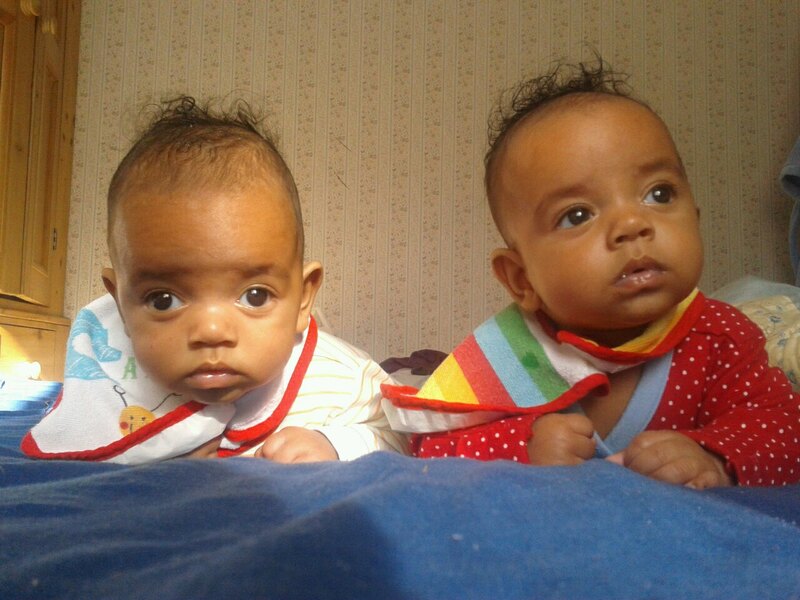 This entry was posted in FUN!, Ileandra's Posts, Real Life Chatter and tagged babies, baby update, BBQs, christmas, halloween, Ileandra Young, michael and leon, postaweek2012, pride parade, real life, sleepless nights, sleepover, smiles, twins. Bookmark the permalink. 19 Responses to Baby Update! So cute! Thanks for the update. ^_^ Thanks for the kind words. Lol, I get like that sometimes. Totally don’t have words! Oh, so sweet. 🙂 They’ll be walking and talking before you know it! I kinda hope they don’t do that too soon; we need to baby proof the house! They are absolutely precious!!! What sweet little things. Oh, mom, you have your hands full. Try to rest when they do and just eat them up as much as you can while they’re little. Before you know it, you’ll be crying at their graduations. It really is true what they say about time flying; I would never have believed it, but four months has just vanished! Its almost a magic act! Yep, four months went by in an eye blink! 🙂 They get more & more fun with each day! Promise! Oh. My. Gosh. They are so stinkin’ cute it’s ridiculous!